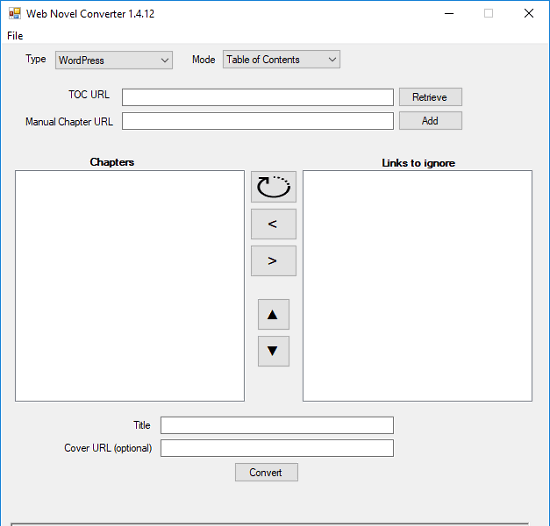 WebNovelConverter is a free WordPress to EPUB converter software for Windows. This software allows you to convert a WordPress blog page to Ebook. It takes a URL of the WordPress site and lets you create Ebook. You add multiple URLs to fetch data and make Ebook. 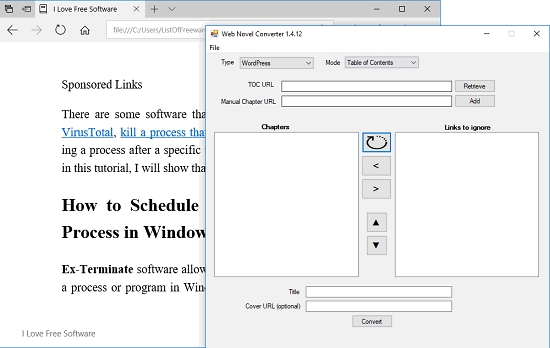 In addition to that you can make chapters in the Ebook and also you can manage the order of the chapters and rename them according to your will. The EPUB file that it creates can be open in any Ebook viewer software. You can use this software if you are reading some novel on a websites and you want to create an Ebook from that. You can easily create an Ebook and do whatever you want. And if you want, you can later add metadata to the Ebook. 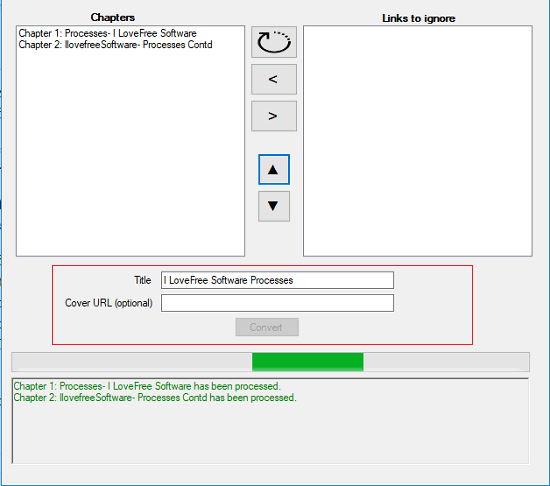 There are some Ebook metadata editor software that you use to add additional information in the Ebook and also you can add front cover as well. How to convert WordPress to Epub with WebNovelConverter? 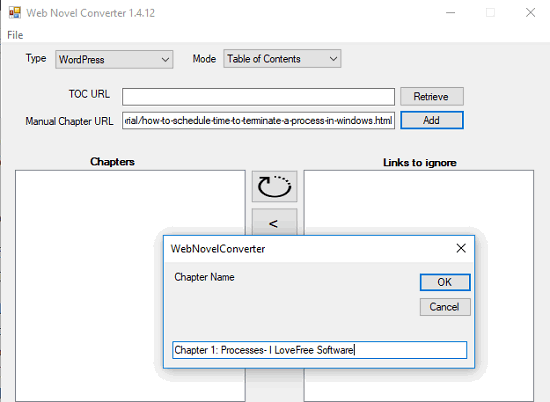 WebNovelConverter makes it easy to convert WordPress to Ebook. There is nothing you have to install as it comes as a portable software and you can easily use it even from a pen drive. Although, it has a classical interface, but it does what it claims. There is no special configuration you have to do in order to use it. Just garb its EXE from the end of this article and start using it. These following steps will help you how to use this software. Step 1: Run the software and its interface will appear. At the top side, you can see the two URL boxes where you can enter the URL of WordPress site you want to convert to EPUB. Step 2: Enter the URL of the WordPress and then it will ask you to enter the name of the chapter. Similarly, you can add multiple URL’s and specify the chapter names. Step 3: When you have defined all the chapter names, simply it’s time to start the conversion. But before starting the conversion, you can also take a look on other options as well. For example, you can change the order of chapters in the list and also you can opt to provide a URL of the cover that you want to have in the Ebook. To start the WordPress to EPUB conversion, hit the Convert button from the bottom and it will ask you to specify the location where you want to save the Ebook file. After the conversion, you can find the final Ebook file in the same folder you have specified. And you can open that file in any Ebook reader or in Microsoft Edge which now shows EPUB files on Windows 10. WebNovelConverter is a very good WordPress to Ebook converter software for Windows. Within a few minutes you can easily convert a WordPress article to Ebook and organize it. So, if you were looking for something like what this software does, then you are at the right place. The above mentioned software along with the steps I have given above will help you.